Visitors to Jasper, Alberta, still love the town’s namesake host, seventy years after his first appearance. On a warm Monday last August, a small crowd gathered on Miette Avenue, in Jasper, Alberta. Their heads craned upward as they squinted to see the bear that had climbed to the top of a tall tree that looked wholly unable to support the animal’s weight. A Parks Canada warden soon arrived to tape off the area and, eventually, return the bear home. Jasper was created in 1948, by Jim Simpkins, a Toronto-based illustrator who was commissioned by Maclean’s to develop a distinctly Canadian animal character. (One of the magazine’s editors suggested the name Jasper.) Jasper is a black bear with an air of playful superiority. He enjoys pranking campers but also warns them that real bears can be dangerous. Jasper appeared in hundreds of single-panel Maclean’s cartoons, and even on a few covers, before eventually starring in a syndicated newspaper strip. 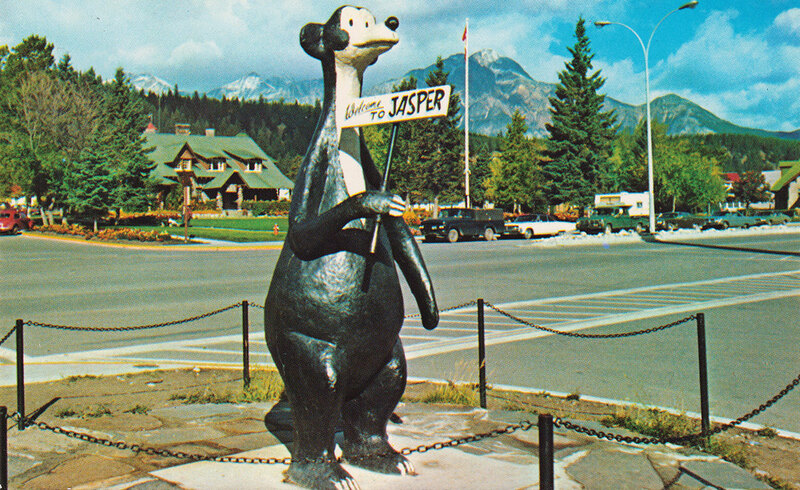 Jasper National Park adopted him as its official mascot in 1962, and he has since appeared on everything from dishes to greeting cards to salt and pepper shakers. New strips haven’t run for several generations (Simpkins retired in 1972 and died in 2004), but Jasper’s popularity continues here, no doubt owing to the easy lovability of a mischievous anthropomorphic bear.